Hot water systems can cause problems every once in a while. Sometimes, when you turn on the shower, it takes a while for the water to actually get warmer. This is due to the amount of distance between the water heater and faucet. This may explain why when you hop into the shower, you are overcome with a cold blast of water! A solution to this is to have a small, water heater in your bathroom. Another issue that occurs with a hot water system is low water pressure. Your hot water pipes are most likely clogged up with deposited minerals. This can cause you water pressure to go from a great amount of pressure with cold water, to barely any water coming out of the faucet with hot water! If you do not want this to occur, you can call a plumber to flush out your water heater yearly and clean out your pipes. Also, a big problem with hot water systems is that the hot water turns off for a while. If you have several people in your home, this is a common problem. After some people take nice, hot showers, they leave you with the icy, cold water that nobody wants! We all know that that’s not very fun! A solution to this issue is having your local plumber come and either install a larger water tank heater, or install a tankless water heater. This way, the entire family can enjoy nice, warm showers! You may also wonder why your hot water tank is noisy. Well, the answer to this is that residue builds up in your water heater, and this may cause those loud pops and pings you hear every now and then! The residue building up in your hot water system can take up a lot of space in your tank, leaving you with a reduced water volume. If this is an issue for you, you can call your plumber to flush out and drain the tank. Another possible trouble you may have is that your water heater smells. No one wants their house filled with an unpleasant odor! You may have this problem because bacteria is entering through your pipes and is growing. Yuck! Luckily, you can call a plumber to handle this issue for you. 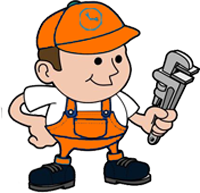 If you are experiencing any of these problems with your hot water system, other problems, or just want a new hot water installed, you can call a plumber to fix them. This way, all your hot water problems will be gone!